Investigator Bill Paatalo: A Plea To These Conspirators – You Have The Power To End This Nightmare. Bill Paatalo has written a heartfelt plea (see his post below) for at least one person to be relieved of stress that is about to literally kill her. In so doing he has again demonstrated his research and forensic skills as a private investigator and one more thing, his humanity. The link to internal emails shows, without any reasonable doubt, both the conspiratorial linkage in creating fabricating documents AND the absence of any reference to any actual transaction in which money was paid or anything was purchased. The lax audacity of these people is astonishing. Here they are actually conspiring to change the paper chain of title — which will be used for a foreclosure of property and the eviction of the owners of the property. Please help save longtime Sandy Oregon resident Robynne Fauley’s life. She had major cancer surgery less than two weeks ago is getting chemo and is VERY ill. She will be evicted from her home on May 1st if we don’t help. She has nowhere to go. The ordeal is very likely to kill he[r;]. I happen to have some knowledge about this case, as I was called in as an expert last year to assist an ABC News investigative journalist in Dallas, TX. Unfortunately, after all the time spent conducting interviews and laying out the evidence of fraud on a platter, corporate counsel for ABC News quashed the story. I’m sure this surprises no one. The reality is that the media will continue to plug its ears, while law enforcement will continue to view and categorize crimes of counterfeiting, forgery, tax evasion, and mail/wire fraud as “civil matters” in the context of foreclosures. So with the clock ticking, I thought I’d throw up a “Hail Mary” plea in the direction of “Diane Meistad” and the rest of these conspirators. Diane, Michael, and the rest of you – if you’re out there and see this, fix it! The following email strand (2008 Internal Emails – MGC – RFC – Quality Loan Servicing – Fauley Case) is a rare glimpse of bank employees conspiring to forge, back-date, and fraudulently produce a chain of title. Hadley: Chris, Does this loan have title issues? I was going through the original documents and the chain of title seems to be missing some assignments. It could have been that this was missed in the file and all is well. I want to make sure. The DOT was assigned to WAMU,FA as of 5/3/2007 by instrument#2007-038181. Once we are able to proceed we will then need an assignment from WAMU, FA in LNV Corporation. Chris, That is what I see too. We received the loan from Residential Funding Company, LLC and have an AOM from RFC to LNV Corporation. Why did RFC assign the loan to WAMU? Do you have a contact at WAMU who will assign the file to LNV Corporation? Doing more research I don’t think Residential Funding Co, LLC had the authority to transfer the interest as the last bene of record per our title report was Deutsche Bank Trust not Residential Funding Co. Here is a copy of the most recent title update from the attorney office and the email chain from our attorney. Shanda, I have 2 RFC loans that are needing assignments from Deutsche Bank to RFC. Please check to see if they are on the list you sent to RFC. See the loan numbers below. Diane, this loan was last assigned to Washington Mutual from RFC but, prior to this assignment was assigned from Washington Mutual to Deutsche Bank and recorded in Clackamas County, Oregon. We need an assignment from Deutsche Bank to RFC and from Washington Mutual to LNV Corp. I have templates for both assignments. We will be re-recording the assignment from RFC to Washington Mutual to correct the chain of title with both of these assignments. Also, please find Note Allonge from Deutsche Bank to RFC as well. Please forward these signed assignments back to me via our federal express account #252870180. Thanks Michael. Michael, If the assignment was recorded from WAMU to DB and another assignment f/RFC to WAMU – technically the second assignment is ‘invalid’ because RFC was not in title to record the second assignment and it should not effect title. Because of the assignment was invalid technically it didn’t transfer ownership. Diane, since the assignment from RFC to WAMU is of record we have to correct the chain of title. At this point the county recorder’s office shows that WAMU is the assignee of record for this loan (which is wrong), right? RFC did assign this loan and shouldn’t have but, in order to fix this one the correct chain should be from Deutsche to RFC, then from RFC to WAMU, then WAMU to LNV Corp, which will correct the chain of title. Litton Loan Servicing LP prepared and recorded the assignment from RFC to WAMU, which should not have been recorded. We still need to get this loan from RFC to LNV to properly convey this property, since we purchased it from RFC. Please call me if you still concerns about the chain of assignments. Borrower loan #7889719/17103058 – Robynne Fauley. Thanks Michael. I disagree since RFC was not in position (title position) to transfer the asset. The Banks say that if the mortgages failed they all would go bust and that there is nothing to backstop the financial system. The rest of us say that illegal mortgage lending and foreclosures was too high a price to pay for a dubious theory of national security. Besides the obvious the big takeaway for me was what I have been advocating since 2007 — if any company in in the alleged chain of “creditors” has gone out of business, there probably is a bankruptcy involved or an FDIC receivership. Those records are available for inspection. And what those records will show is that the the bankrupt or insolvent entity did not own the debt that arose when you signed documents for the benefit of parties other than the source of funding. It will also show that the bankrupt or insolvent entity did not own the note or mortgage either. This is instructional for virtually all parties “involved” in a foreclosure but particularly clear in the cases of OneWest, whose entire business plan depended upon fraudulent foreclosures, and Chase Bank who bet heavily on getting away with it and they have, so far. BUT looking at the bankruptcy and receivership filings of IndyMac and WAMU respectively the nature of the fraud was obvious and born out of pure arrogance and apparently a correct perception of invincibility. All such bankruptcy proceedings and receivership require schedules of assets right down to the last nickle in bankruptcy. Belanger simply looked at the schedule, knowing he never took the loan, and found without surprise that the bankrupt entity never claimed ownership of the debt, note or mortgage. The big message here though is not just for those who are being pursued in collection for loans they never asked for nor received. The message here is to look at those schedules to see if your debt, note or mortgage is listed. Lying on those forms is a federal felony punishable by jail. Those forms are the closest you are ever going to get to the truth. Odds are your loan is nowhere to be found — even if you did get a loan. JUST WANTED TO TELL YOU ALL SOMETHING, THAT I JUST GOT DONE , FROM MERSCORP! ON OUR PROPERTY THERE WAS A 2d MORTGAGE ON IT, IT WAS A LINE OF CREDIT THAT WE DID NOT DO, AND WE DID REPORT IT TO THE RIGHT AUTHORITY’S, BACK IN 2006/2007. NOW THE COMPANY WAS GMAC MORTGAGE CORP.
OVER THE YRS, FROM 2006 TILL NOW, IT REMAINED ON PROPERTY, UNTIL JUST LAST WEEK, WHEN I DEMANDED THAT MERS DISCHARGE IT. AND AFTER THEY FOUND OUT IT WAS NEVER ASSIGNED OUT OF MERS, THEY HAD TO DISCHARGE IT. BECAUSE GMAC MORTGAGE IS DEAD. NOW THIS GO TO WHAT WE ALL HAVE SAID HERE. ANY ASSIGNMENT THAT HAS NOT BEEN DONE, OR RECORDED AT REGISTRY OF DEEDS, OUT OF MERS, AND THE MORTGAGE COMPANY IS A DEAD MORTGAGE COMPANY. THEN MERS WILL DISCHARGE IT . I HAVE A COPY OF THE DISCHARGE IN HAND. AM STILL FIGHTING, BECAUSE OF THIS NEWS, I HAVE ASK MY ATTORNEY TO NO AVAIL TO DO A QWR ON THE COMPANY THAT RECORDED AN ASSIGNMENT IN 2012, EVEN THOUGH GMAC MORTGAGE CORP WAS IN BK AND AFTER GOING THROUGH ALL BK RECORDS OF EACH ENTITY, THAT HAD TO FILE ALL ASSET OF THERE COMPANY, AND FOUND THAT NO ONE IN GMAC HAD THE MORTGAGE AND NOTE, 3 MONTHS PRIOR TO THE ASSIGNMENT BEING PUT ON MY RECORD. BEEN REGISTERED IN ANY STATE. LET ALONG THE STATE OF DELAWARE, THE STATE THEY SAY IT IS REGISTERED IN. THE SECRETARY OF STATE SAID NO. AND HAS NEVER BEEN A LEGAL OPERATING TRUST, EVER. SIGNED AND NOTARIZED BY THE SECRETARY. THE FRAUD TRUST NAME IS AS FOLLOWS. The arrogance of the banks is subsumed in the decisions of courts. That the writer of an instrument would attempt to literally write language into an instrument that contradicts the laws of evidence is arrogant; but the fact that judges are accepting it because it appears in black and white, is abdication of the judicial function. From Bill Paatalo, who continues his unending analysis to corroborate the narrative that the banks and servicers are defrauding investors, homeowners and the courts. The offending language directly contradicts the hearsay and best evidence rule when applied to homeowners who are not party to the instrument and are even barred from introducing elements of the trust instrument (Pooling and Servicing Agreement) to support their trial objections and cross examination of robo-witnesses. Provisions like the one quoted below are used extensively to allow complete strangers to intervene while brandishing only a photocopy of unknown origin and authenticity. Note that this Agreement merely specifies that the parties intend to do something — not that the loans are hereby conveyed, transferred, assigned or endorsed. This is because the loans do not yet exist. Note also that the the first signature page of the document is signed by someone purporting to be from WAMU but no signature is shown for Countrywide. This is corroboration that incomplete and partial documents are field regularly with the SEC without review. The second signature page, which could have been attached at any time, is the reverse. Note also the reference to the MLS (Mortgage Loan Schedule). I have seen no MLS that conforms to this language even though the documents usually specify all the elements contained in these definitions. On Exhibit 12, entitled Mortgage Loan Schedule, there is nothing listed. Sometimes we see a reference to a third party who keeps a “binder” containing the MLS. IN no case that I have seen, has an original filing with the SEC ever contained a Mortgage Loan Schedule — except where the prospectus contains an acknowledgement that the MLS is false and is shown only by way of example what the MLS should look like. Here’s that lovely language again. What is also interesting is Section 6.04 states that the MERS ID must be changed to investor “1003646” and this belongs to BofA as Trustee/Custodian for WaMu/WMMSC (attached.) I’ve never seen this ID, nor have I ever seen assignments to WMMSC as contemplated in this agreement. SECTION 28. Reproduction of Documents. This Agreement and all documents relating thereto, including, without limitation, (a) consents, waivers and modifications which may hereafter be executed, (b) documents received by any party at the closing, and (c) financial statements, certificates and other information previously or hereafter furnished, may be reproduced by any photographic, photostatic, microfilm, micro-card, miniature photographic or other similar process. The parties agree that any such reproduction shall be admissible in evidence as the original itself in any judicial or administrative proceeding, whether or not the original is in existence and whether or not such reproduction was made by a party in the regular course of business, and that any enlargement, facsimile or further reproduction of such reproduction shall likewise be admissible in evidence. “Private investors own the subject loans, and their identity is being concealed. From experience, I have seen and reviewed JPMC’s servicing records for WMB originated loans within JPMC’s “3270 Explorer” servicing platform. This system / platform contains a specific screenshot which shows the “loan transfer history” (Screen: “Explorer 3270 – LNTH”) for these loans. From experience, I have seen complete LNTH screenshots for these WaMu loans provided by JPMC, but usually they are produced with great reluctance and through motions to compel. When produced, these LNTH screens tell an entirely different story about the loans; specifically, all the sales and transfers conducted prior to the FDIC’s receivership. Attached as Exhibit 6 is a “3270 Explorer: Loan Loan Transfer History (LNTH)” screenshot provided by JPMC in a very similar case which I have been involved captioned Kelley v. JPMorgan Chase Bank, N.A., U.S. BK CT, ND CA, Adv. Case No. 10-05245. Like the [REDACTED]loans, the Kelley loan was also originated by Washington Mutual Bank, F.A. Exhibit 6 shows the entire LNTH from origination through the FDIC receivership. The beginning “Investor Code” at the inception of the loan is “030” on 08/07/07. The loan is then sold and transferred to a “New/Inv” (new investor) on 09/01/07 with the “Investor Code – AO1”: the same code for both [REDACTED] loans on 12/31/2005. It can be logically deduced from this evidence that the same originator code of “030” should also exist on the [REDACTED] loans if WMBFA was the originator. (In reference to Exhibit 4). Q. Now if you look to the right of that, it states that the claim – the investor IDs begin with an A through V; is that correct? A. In the current MSP platform, yes, indicates private investor loans. Q. And what would X,Y,Z indicate? A. Those would indicate bank-owned assets. Bottom line – Chase’s own witness testified that “Ao1” is a private investor, and this code does not mean “bank owned.” With the LNTH screenshots now appearing with no pre-receivership sales and transfer activities entered by WaMu, it is almost too much to believe that one of the largest banking institutions in the world, would not have tracked the loans it originated and sold into the secondary market within its servicing systems. Having investigated the WaMu/FDIC/Chase fact pattern for nearly seven-years now, and having investigated hundreds of foreclosure cases where JPMorgan Chase claims sole ownership of specific Washington Mutual Bank loans by virtue of the “Purchase & Assumption Agreement” (PAA) with the FDIC, one fact is now well established – no schedule or inventory of assets listing any specific WMB mortgage loan acquired by JPMC exists, or has ever been produced or disclosed. The reason for this fact is that the vast majority of residential mortgage loans were securitized through WaMu’s “Off-Balance Sheet Activities,” meaning WMB sold their loans prior to the FDIC Receivership. Many of these prior sales transactions by WMB to private investors went undocumented, and were kept outside the prevue of regulators, the borrowers, and the general public. For roughly the past 8-years, Chase has been foreclosing on thousands of these previously sold WMB loans in its own name as mortgagee and beneficiary of the security instruments, when by Chase’s own admissions to numerous borrowers, the loans were sold to private investors. “Your loan was sold into a public security managed by JPMorgan Chase Bank, N.A. and may include a number of investors. As the servicer of your loan, Chase is authorized by the security to handle any related concerns on their behalf” (See: Chase Private Investor Letters ). 16. On September 26, 2008, as a result of the FDIC’s takeover of Washington Mutual Bank and the bankruptcy of Washington Mutual, Inc., Plaintiffs’ investments in the Preferred Trust Securities automatically converted into preferred stock of Washington Mutual, Inc., and thereby rendered worthless. These loans were some of the worst, fraud-laced loans originated by WMB, yet my initial investigation has yet to find a single foreclosure action (judicially or non-judicially) in the name of any of these investor trusts. How can this be, you ask? Simple, because JPMorgan Chase has decided to claim ownership of these loans, and continues to foreclose and harvest these assets in its own name by concealing these facts, and denying in Courtrooms that WMB ever sold or securitized these loans. This fraud story, which Chase and its attorneys continue to stick to, is no longer believable or sustainable based on the cumulative evidence compiled in the public domain. I can pretty much assure that all 67,529 of these loans have a non-existent and fatally defective chains of title. But here’s something even more dubious and suspicious. In “JP Morgan Chase & Co.’s” 10-K filings with the SEC for fiscal years 2009-2013, “Washington Mutual Home Equity Trust I,” “WaMu 2006-OA1,” and “WaMu 2007-FLEX1” are all listed as subsidiaries of the company, but vanished as subsidiaries beginning in 2014. 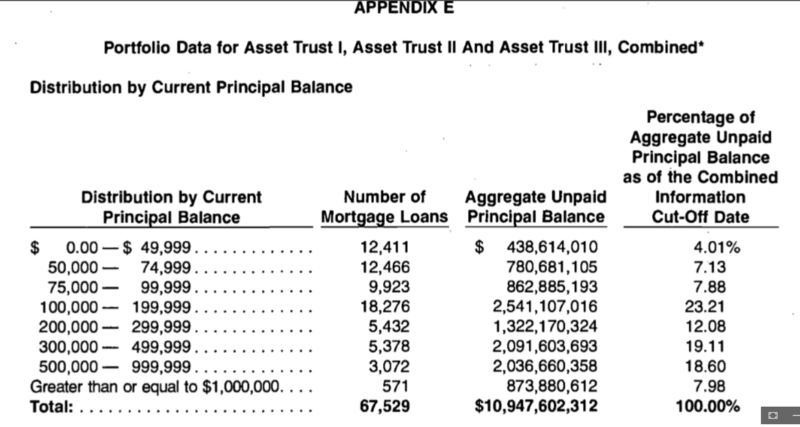 What I suspect is that these 67,529 loans, or whatever is left of them, were sold by Chase in hedge fund debt purchases in 2014, along with the non-existent chains of title. I’ll save that for another article. These trusts were set-up as Delaware Statutory Trusts with REMIC status. In virtually all PSA agreements for DST’s that are visible, to which the DST’s are irrevocable and elect REMIC status, they are required to maintain complete separateness from any other person or entity. Chase’s naming of these trusts as subsidiaries certainly smells “fishy.” At best, Chase acquired servicing rights to these loans, but even this should not be assumed. How a servicer can take control of a REMIC Trust and claim it as a subsidiary on its 10-K is beyond me, but I’d sure like to see the documentation granting this authority. In the meantime, someone explain to me how tens of thousands of foreclosures have been conducted in the names of private MBS REMIC trusts since the crash in 2008, and not one foreclosure appears to have occurred within this toxic group of 67,529 loans in the name of Deutsche Bank as Trustee for these trusts. The odds are virtually impossible. Books and Manuals authored by Neil Garfield are also available, plus video seminars on DVD. Bill Paatalo, whose case opened the door for homeowners on the issue of rescission and other matters discussed on this blog, asks the central question: His telephone number is 406-328-4075. If the WAMU process involved destruction of documents, no endorsement and no assignment, then how can Chase retroactively correct this fatal deficiency in the absence of producing proof of the money chain? Courts have been ignoring this question but the tide is definitely turning. But his question has a much wider scope. The same question applies to the mergers and FDIC deals across the country that occurred in the aftermath of the mortgage meltdown. Read his article and his support and you will see that the fatal defects exists. Courts have been ignoring this because of their improper presumption that the transaction really occurred when the loan was originated. But all evidence points to the contrary and no evidence points to any other conclusion, to wit: nearly all the loans were table funded (and therefore predatory per se under REG Z). and that means that the “originator” was not the lender, creditor or source of funds for the origination or acquisition of the alleged loan. The argument in opposition is “Where do you think the money came from?” THAT is not argument. It is obfuscation. The fact is that the ONLY parties with the real answer to that question refuse to reveal the truth. It is hardly a reason to shift the burden of proof or the burden of persuasion to the one party with the least access to the truth. At some point the courts must stop accepting self-serving statements from counsel as the basis upon which they issue a ruling.